This is the third entry in a series of tutorial articles that are designed to help new players learn the ASLSK rules. Links to other entries in this series may be found at the end of this article. This article assumes that the reader has read, and understood, the previous articles. Rules and concepts discussed in the earlier articles will be used here with little or no explanation. In this article I will present a small battle between the Germans, attacking with six squads, and the Russians, defending with four squads. The focus this time is on illustrating how a typical ASLSK scenario flows, rather than introducing new rules or units. The previous examples featured a close-range assault on a building, where maneuvering was more important than Prep Fire. This battle will start off at much longer ranges, and Prep Fire will be critical. In addition, this battle will last several turns, so routing and rallying will be demonstrated in more detail. I need to point out that, while I may have a reasonable understanding of the ASLSK rules (one would hope so, anyway, if I'm writing tutorial articles! ), I am by no means an expert ASL player. The Russian defense plan that I'm going to use is almost certainly not the best defense possible, and the German attack plan may be less than optimal as well. These plans are sufficient for the purpose of this article, which is simply to demonstrate the ASLSK rules in action, but you may well notice ways in which they may be improved. I hope, however, that this battle will be a typical example of the kind of game you might see between players of average skill levels. Grain is not in season, so all grain hexes are treated as Open Ground. The road in yY10 exits the North edge of the map. The Germans will move first. Both sides have an Experience Level Rating (ELR) of 3. To win this scenario, the Germans must capture yU6. There is no time limit... the game will continue until the Germans win. Why no time limit? The moves that I will be recording will be my first playing of this scenario; and without having played the scenario, I have no way of knowing what time limit would give each side a reasonable chance to win. This will be a demonstration game, so the lack of a time limit will not be a problem: both sides will play as if there is a time limit. Once the game is complete, I will be able to suggest a time limit that would work for anyone who might want to play the scenario against an opponent. (B) Attacking units should move instead of using Prep Fire. I disagree with both of these... not because they are incorrect, but rather because they are often presented as absolute truths, which I think teaches the wrong lessons to a beginner reading them. (A) Stack only when you have a valid reason to do so. The drawback with stacking is that it multiplies the effectiveness of your opponent's attacks. For example, if your opponent rolls a 1MC against a single squad, only one Morale Check is made; but if that 1MC is rolled against a stack of three squads, then three Morale Checks will be made... essentially tripling the effectiveness of the attack. (B) Think about moving before you think about Prep Firing. If you decide who needs to move before you start Prep Firing, then you will avoid having too many units firing and not enough units moving. In the previous battles we've looked at, Prep Fire was ineffective, and the use of maneuver was critical for the attacker to have a chance of winning. In the battle featured here, the attackers will have to use Prep Fire to blast their way to the objective. This battle will be dominated by the wide open space that the Germans must cross to reach their objective (remember that the grainfields are out of season and do not exist). With no cover, and low Smoke Exponent numbers, the Germans will be slaughtered if they try to simply charge across that Open Ground. One key for the Russian defense is to keep the Germans out of the stone buildings in yZ7-yZ8-yZ9 for as long as possible, as those would be excellent positions to use in attacking yV6 and yW6. The Russians have therefore placed the bulk of their defensive forces in yZ7. This gives the Russians a basic 12/–1 shot that will dominate most of the battlefield. Note that the –1 leader will cancel the +1 TEM of the woods hexes, so this stack will fire on Germans in woods hexes as if they were in Open Ground (a 12/+0 shot). Stacking does make the Russians more vulnerable, but the Russians are hoping that the +3 TEM of the stone building, and the –1 leader, will counter that vulnerability. The Russian 7-0 leader is set-up out of LOS to serve as a rally point for the squad in yW6. If he was stacked with the squad, they would not run the risk of cowering, but the Russians do not want to take a chance that he might break. He needs to be available to rally that squad quickly so that they can fall back to yU6 for the final defense of the objective. The squad in yU3 is probably a mistake: it's isolated with no safe rout path, and is far away from where the Germans will appear. But, it is in position to cover the Open Ground even if the other Russian defenders break or fall back, and if the Germans ignore it, it may be able to run over to yU6 later. The most striking feature of the German set-up is the huge stack in yDD3. ASL players call such a stack a "kill stack" since its purpose is to kill (or at least break) enemy units. With a –2 leader directing 20 FP, this kill stack is the perfect tool for cracking tough defensive positions in stone buildings. But this power comes at a cost: if the Russians can get a lucky hit on the stack, the German attack can unravel very quickly. The Germans must make maximum use of this kill stack, while, at the same time, minimizing its exposure to Russian attacks. The squad and 8-1 leader in yDD1 expend 2 MF to enter yCC2. Why didn't the other German units use Assault Movement to enter the tree line? By waiting until the Advance Phase (APh) to enter the tree line, the Germans will make the Russians waste their first Defensive Fire Phase (DFPh). Remember, they don't want to give the Russians any free shots at their kill stack. Avoiding the Russian defensive fire also means that the Germans will not be able to make any advancing fire attacks... but the kill stack would only have had 7.5 FP for such an AFPh attack (one-half FP, no ROF possible, and the MMG could not fire because it moved). 4-6-7, LMG, 8-1 advance from yCC2 to yBB2. 4-6-7 advance from yDD2 to yCC3. Kill stack advance from yDD3 to yCC4. 4-6-7 advance from yDD5 to yCC6. 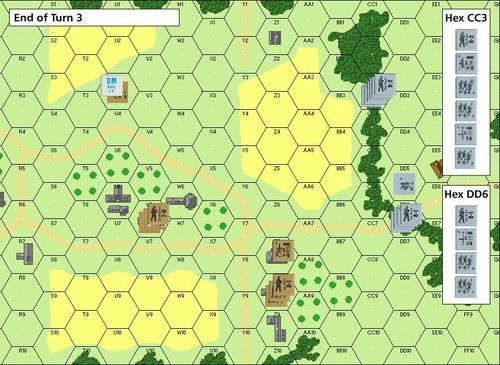 Notice that the kill stack in yCC4 is more than four hexes from all of the Russian squads, so only the Russian MGs can fire at it with full FP... but the two most important Russian positions are with range of the German squads in the kill stack. The German player has taken full advantage of the shorter range of the Russian squads, minimizing the danger to his kill stack while leaving it fully effective. The Russians have only a single German squad within their normal range... and the German player hopes that they will fire at it instead of at his kill stack. The squad in yU3 fires at yCC6. The range is 8 hexes, which is the maximum range for this squad (normal range: 4 hexes, long range: 4 x 2 = 8 hexes). The shot is 2/+1 (4 FP cut in half for long range, +1 TEM for the woods hex). The DR is 4 and doubles (2,2) which causes the squad to cower, so the attack will shift one column to the left and use the 1 FP column, where the result is a PTC. The German squad's PTC DR is 5, so they are not pinned. Put a Prep Fire counter on yU3. The Russian stack in yZ7 must now decide which target to shoot at. The German squad in yCC6 could be attacked with full FP, or the German kill stack could be attacked with the Russian squads firing at half FP because of the long range. The presence of the 9-2 leader makes the kill stack a very tough target... but it is also the biggest threat to the Russians, so the Russian stack in yZ7 fires at yCC4. The shot is 8/+0 (8 FP cut in half for long range, 4 FP MMG, –1 leadership, +1 TEM). The DR is 4 (colored dr 3), resulting in a 2MC. The 9-2's Morale Check (MC) DR is 6, resulting no effect (6 + 2 is less than 9). The three squads will now each receive a –2 DRM from the 9-2 leader. This Leadership Modifier cancels out the +2 DRM from the 2MC IFT result, so each squad will make an unmodified MC DR. The MMG/4-6-8's MC DR is 5, resulting in no effect. The LMG/4-6-7's MC DR is 9, so it breaks and is flipped over to its broken side. The final 4-6-7's MC DR is 8, so it also breaks and is flipped over to its broken side. Place a DM counter above the two broken squads, and place a Prep Fire counter on yZ7. The Russian MMG did not retain ROF, because the colored dr was greater than 2, so it cannot fire again. The Russian stack rolled up a great Prep Fire shot, but the German kill stack managed to survive it in fairly good shape, with the 9-2 leader unharmed and just a couple of broken squads. The German attack has received a setback, but it has not been stopped. The Russian squad/LMG in yW6 declares Assault Movement and spends 2 MF to enter yV6. The Germans decline to fire. The 4-6-8/MMG/9-2 in yCC4 fires at yZ7 (the broken units cannot fire). The shot is 8/+1 (9 FP, –2 leader, +3 TEM), and the DR is 11 (colored dr is 5), resulting in no effect and no ROF. Place a Final Fire counter on yCC4. The stack in yCC4 now looks like this, from the bottom up: broken 4-6-7, broken 4-6-7, LMG, DM, 4-6-8, MMG, 9-2, Final Fire. The 4-6-7/LMG/8-1 in yBB2 fires at yZ7. The shot is 6/+2 (7 FP, –1 leader, +3 TEM), and the DR is 6 (colored dr is 3), resulting in a PTC and no ROF. The Russian 8-1 leader's PTC DR is 8, resulting in no effect. The –1 Leadership Modifier will now be applied to both squads' PTC rolls. The MMG/4-4-7's PTC DR is 6, resulting in no effect. The 4-4-7's PTC DR is 7, resulting in no effect. Place a Final Fire counter on yBB2. The 4-6-7 in yCC3 fires at yZ7. The shot is 4/+3, and the DR is 5, resulting in no effect. Place a Final Fire counter on yCC3. The 4-6-7 in yCC6 fires at yZ7. The shot is 4/+3, and the DR is 7, resulting in no effect. Place a Final Fire counter on yCC6. Remove the Final Fire counters. The Germans took four separate shots, including two with leader direction, at the main Russian stack and failed to do any damage. The +3 TEM of the stone building kept the Russians safe. The failure of these weak attacks demonstrates why the Germans need a powerful kill stack, and are willing to accept the increased vulnerability of stacked units in order to use one. No activity. Remove the Prep Fire counters. The Russians have no broken units. The Germans have two broken squads in yCC4. These squads are not in Open Ground and are not adjacent to an unbroken enemy unit, so they are not forced to rout. But they are covered with a DM counter, so they may rout if they wish. They are already stacked with the best German leader, so it is tempting to leave them there. But even with the leader's –2 DRM they would need a DR of 6 to rally (7 broken side morale, +4 DM DRM, –2 leadership DRM, –1 woods hex DRM), which is not really a good chance, and the Russians will continue to fire at that hex so they will always be under a DM counter. It's possible that they may never rally under these conditions, and the Germans can't get an effective kill stack if broken squads are present, because of the stacking limit of three squads per hex, so the broken squads will rout away. The broken squads must rout to the nearest woods or building hex that is a legal rout destination. The closest such hexes are yCC3 and yCC5, both 2 MF away. They cannot rout to yCC5, because they would be moving closer to the known Russian units in yZ7. yCC3 is a legal rout destination, but the Germans may choose to ignore it because it is no further away from the Russians in yU3 than their present hex. Normally, the Germans would ignore yCC3, because routing to that hex would leave the broken units in the LOS of Russian units, but, in this case it will work OK, so the German player announces that yCC3 will be his rout destination. The broken units must rout one at a time. The 9-2 leader could choose to accompany either broken squad, but he will not do so... the Germans need to use his –2 leadership DRM to direct shots against the Russians rather than to rally broken units. All routing units (except wounded leaders) have 6 MF to use. The broken 4-6-7/LMG will rout first. It expends 2 MF to enter yCC3. There is no interdiction because this hex is not Open Ground. The broken unit has reached its rout destination, so it must stop there... unless it can enter an adjacent woods or building hex. Once a broken unit reaches cover, in the form or a woods or building hex, it will not move back out into the open, but it may continue to move into other adjacent "cover" hexes. 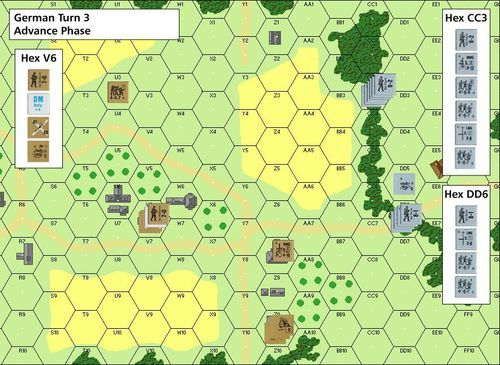 This is why yCC3 works as a rout destination, even though it is in the LOS of Russian units: the broken unit can now spend an additional 2 MF to enter yCC2, which is not in the LOS of any Russian unit. The other broken 4-6-7 now expends 4 MF to also rout to yCC3-yCC2. Both broken squads are now in a safe hex that cannot be fired upon by the Russians, and they are adjacent to a leader who will eventually be able to move in and assist them in rallying. The DM counter moves along with the broken units as they rout. The 4-4-7/LMG in yV6 advances into yW6. What is this Russian squad doing, anyway? It runs away in the MPh, and then returns in the APh?! This tactic is commonly called "skulking." Because the Russians moved out of LOS in the MPh, the Germans see nothing but an empty building during their DFPh. But when the German MPh comes around, suddenly there are Russian units in that building ready to blast any German unit that moves into the open. So now the Germans have to use Prep Fire to try to break the defenders... and German units that Prep Fire are not moving closer to the objective, which is exactly what the Russians want. Many ASL players see skulking as a very unrealistic tactic, while others argue that it intentionally simulates defenders ducking down out of sight to avoid being shot at. ASL's detractors are quick to point out skulking as an example of how unrealistic and/or ridiculous ASL is... conveniently ignoring the fact that the games they prefer will have equally unrealistic aspects, since there is no such thing as a perfect simulation. I see skulking as an artifact of the multi-phase sequence of play that ASL uses. Sure, it's unrealistic, but as a design for effect game, ASL/ASLSK has an overall realistic feel in spite of the various unrealistic elements that are present. And regardless of how you view skulking, it is completely legal, you will see it used against you, and you should use it when it makes sense to do so. Skulking is actually not all that common. In this battle, for example, only one of the three Russian positions can use it effectively... and it is easy to argue that the Russians might have been better off using that squad/LMG to Prep Fire instead of skulking. But since that squad is currently the only one in position to actually occupy and defend the objective (yU6), the Russian player does not want to risk it any more than he has to. The German attack is off to a shaky start, and the Russians are holding firm. The broken German squads, because they are not stacked with a leader, cannot make a rally attempt. But, because this is the German player turn, the Germans may select any one broken unit to make a self-rally attempt, even if that unit does not have self-rally capability. The Germans select the broken 4-6-7/LMG to make a self-rally attempt. The DRMs are +4 DM, +1 self-rally, –1 woods hex. The DR is 4, so the squad fails to rally (4 + 4 is greater than its broken side Morale of 7). A DR of 3 or less was needed for the self-rally to succeed. Given the lack of success the Germans had with their defensive fire, they decide to try a different tactic. The units in yBB2, yCC3, and yCC4 combine to form a multi-hex Fire Group (FG), and fire at yZ7. No leadership DRMs will apply, even though two leaders are present. Leadership can only be used with a multi-hex FG if there is a leader in every hex, and even then only the lowest Leadership Modifier can be used. The Germans are hoping that sheer FP will give better results than smaller, leader assisted attacks. The shot is 20/+3, and the DR is 3 (colored dr is 2), resulting in a 3MC. The 8-1's MC DR is 7, which breaks him (7 + 3 is greater than 8). Flip the 8-1 over to his broken side. His Leadership Modifier cannot be used to assist the Russian squads with their MCs. The MMG/4-4-7's MC DR is 5, which breaks them. Flip the 4-4-7 over to its broken side. The 4-4-7's MC DR is 2, which results in no effect. Now the unbroken 4-4-7 must take a PTC with a +1 DRM, because it is stacked with a leader with a higher Morale value who broke as a result of this attack. This is a Leader Loss Task Check (LLTC, rule 3.2.1). The LLTC does not apply to the broken 4-4-7/MMG squad, because broken units cannot be pinned (except by interdiction during a rout). The LLTC DR is 8, so the 4-4-7 is pinned. Place a Prep Fire counter on yBB2 on top of the 4-6-7/LMG, but under the 8-1. Place a Prep Fire counter on yCC3. Place a Prep Fire counter on top of the 4-6-8 squad in yCC4, but under the MMG, because the MMG maintained ROF and can shoot again. Place a DM counter on the broken units in yZ7, and a Pin counter on the unbroken 4-4-7. The stack in yZ7 now looks like this, from the bottom up: broken 4-4-7, MMG, broken 8-1, DM, 4-4-7, Pin. The German MMG retained ROF and can now shoot again. It fires at yW6. The shot is 4/+3 (5 FP, +3 TEM), and the DR is 6 (colored dr is 1), resulting in no effect, but ROF is retained again. The German MMG fires again at yW6. The shot is 4/+3, and the DR is 5 (colored dr is 3), resulting in no effect and ROF is lost. Move the Prep Fire marker in yCC4 on top of the MMG, but under the 9-2 leader. The 4-6-7 in yCC6 fires at yZ7. The shot is 4/+3, and the DR is 7, resulting in no effect. Place a Prep Fire counter on yCC6. The German 8-1 leader in yBB2 spends 2 MF to enter yCC2, where he will be able to assist the broken squads in rallying in the next RPh. The 4-4-7 in yU3 fires a long range shot at yCC6. The shot is 2/+1, and the DR is 9, resulting in no effect. Place a Final Fire counter on yU3. The 4-4-7/LMG in yW6 fires at yCC6. The shot is 4/+2 (long range for the squad, normal range for the LMG, +1 hindrance for yX6). The DR is 3 (colored dr is 2), resulting in a 1MC and no ROF. Place a Final Fire counter on yW6. The 4-6-7's MC DR is 4, resulting in no effect. The pinned 4-4-7 in yZ7 fires at yCC6. The shot is 2/+1, and the DR is 8 and doubles, so the shot cowers to the 1 FP column and has no effect. Place a Final Fire counter on yZ7. No activity (no units can shoot). Remove the Prep Fire counters. The German broken units are not under DM and may not rout. The Russian broken units may rout, and will use yZ8 as their rout destination. Moving individually, they will spend 2 MF to enter yZ8, and then an additional 2 MF to enter yZ9 (an adjacent building hex). There will be no interdiction. The broken 4-4-7 must abandon the MMG when it routs. A routing unit will never carry anything that would slow it down, and the MMG's 5PP exceeds the squad's IPC of 3. The MMG is placed at the bottom of the stack in yZ7, to signify that it is not possessed by any unit. The DM counter moves with the broken units to yZ9. The 4-6-7/LMG in yBB2 advances into yCC3. The 4-6-8/MMG/9-2 stack in yCC4 advances into yCC3. The kill stack has been reformed. The 4-6-7 in yCC6 advances into yBB6. This move, while somewhat dangerous for the Germans, directly threatens the broken Russian units in the north. The Russians will have to respond to it... which means they'll be shooting at the advancing German squad and not at the German kill stack, allowing the kill stack to go about its business with ruthless efficiency (or so the German player hopes, anyway). No activity. Remove the Pin counter. The 4-4-7 squad in yZ7 attempts to recover the abandoned Russian MMG. The recovery dr is 1, so the MMG is recovered and is placed on top of the 4-4-7. The broken Russian 8-1 leader in yZ9 has a box around his broken side Morale of 8, which signifies that he has self-rally capability. The Russian leader attempts to self-rally with a +4 DRM (+4 DM, +1 self-rally, –1 building hex). The rally DR is 8, so the rally attempt fails. Because this is the Russian player's turn, he may also select any one broken Russian unit to attempt a self-rally, so he selects the broken 4-4-7 in yZ9. The DRM is the same as for the leader's self-rally, and the rally DR is 4, which also fails. The German 8-1 leader in yCC2 will attempt to rally the two broken squads. The DRM for each attempt will be –2 (–1 leadership, –1 woods hex). The rally DR for the 4-6-7/LMG is 3, so the squad rallies (3 – 2 is less than the squad's broken side Morale of 7). Flip the squad back to its unbroken side. The rally DR for the 4-6-7 is 4, so that squad rallies as well and is flipped back to its unbroken side. Remove the DM counter from yZ9. The 4-4-7 in yU3 fires at long range at yBB6. The shot is 2/+0, and the DR is 5, resulting in a NMC. The 4-6-7's MC DR is 9, so the squad breaks and is flipped over to its broken side. Place a Prep Fire counter on yU3, and place a DM counter on yBB6. 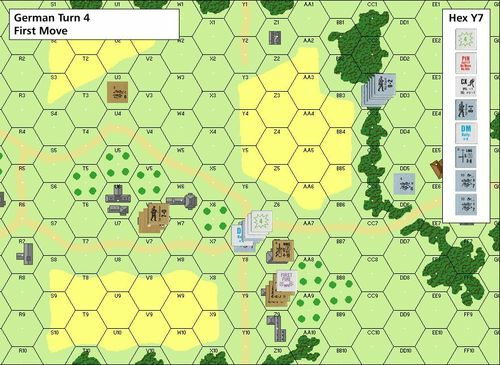 With the threat to the broken Russian units neutralized, the 4-4-7/MMG in yZ7 fires at yCC3, as the German kill stack is now the greatest threat. This is a long range shot for the squad, and a normal range shot for the MMG. The shot is 6/+1, and the DR is 6 (colored dr is 5), resulting in a NMC and no ROF. The 9-2 leader's MC DR is 6, resulting in no effect. His –2 Leadership Modifier will now apply to the MCs of each of the three squads. The MMG/4-6-8's MC DR is 3, resulting in no effect. The LMG/4-6-7's MC DR is 9, so the squad is pinned (9 – 2 is equal to the squad's Morale of 7). The 4-6-7's MC DR is 8, resulting in no effect. Note that, without the presence of the leader's –2 DRM, both this squad and the 4-6-7/LMG would have broken. Place a Prep Fire counter on yZ7. Place a Pin counter on the 4-6-7/LMG and move it to the bottom of the stack (so that the unpinned units are above the Pin counter). The 4-4-7/LMG in yW6 declares Assault Movement and expends 2 MF to enter yV6 (still skulking). The kill stack in yCC3 fires at yZ7. The pinned 4-6-7/LMG will fire at half FP, and the LMG cannot retain ROF regardless of what the colored dr is. The shot is 16/+1 (16.5 FP, –2 leadership, +3 TEM), and the DR is 6 (colored dr is 4), resulting in a 2MC and no ROF. The 4-4-7's MC DR is 6, so the squad breaks and is flipped over to its broken side. Remove the Prep Fire counter from yZ7 (broken units can't move or fire, so the Prep Fire counter no longer has any meaning). Place a DM counter on yZ7. There are no other possible defensive fire shots, so there is no need to place a Final Fire counter on yCC3... you would just immediately remove it. The Russian stack in yV6 fires at yBB6. The shot is 2/+1 (4 FP squad cut in half for advancing fire, and cut in half again for long range fire; 2 FP LMG cut in half for advancing fire; +1 hindrance DRM for firing through an orchard hex (yX6). The DR is 12, which results in no effect on the broken German squad, but the LMG suffers a breakdown and is flipped over to its malfunctioned side. The Russian 7-0 leader prevents cowering... not that it matters any in this case! Remove the Prep Fire counter. Both sides have broken units to rout, but the Russians will go first because it is their player turn. The broken 4-4-7 in yZ7 will abandon the MMG and rout to yZ9, bringing the DM counter with them. Place this squad and DM counter at the bottom of the stack in yZ9, to show that the DM counter only affects this squad. The broken 4-6-7 in yBB6 routs to yCC6 and yDD5, bringing the DM counter with it. The Russian northern position collapses as the German firepower begins to take a toll. The Russian defense has been reduced to two squads with no support weapons... while the German kill stack may finally make its first full-power shot. The Russian 4-4-7 in yW6 attempts to repair the LMG. The repair dr is 2, which fails. The Germans attempt to self-rally the broken 4-6-7 in yDD5. The rally DR is 12, which fails... but the broken squad suffers casualty reduction and is replaced by a broken 1st Line half-squad (HS). The broken Russian 8-1 leader in yZ9 attempts to self-rally. The DRM will be 0 (+1 self-rally, –1 building hex). The rally DR is 11, which fails. Neither of the broken Russian squads may attempt to self-rally, because it is not the Russian player turn. The German stack in yCC3 fires at yW6. The shot is 20/+1, and the DR is 7 (colored dr is 1), resulting in a 2 MC and ROF for both the LMG and the MMG. The LMG/4-4-7's MC DR is 4, resulting in no effect. Both MGs will fire again at the same target. The shot is 8/+1, and the DR is 7 (colored dr is 2), resulting in a NMC and ROF for the MMG. The LMG/4-4-7's MC DR is 6, resulting in no effect. The MMG will fire again at the same target. The shot is 4/+1, and the DR is 4 (colored dr is 1), resulting in a 1MC and ROF for the MMG. The LMG/4-4-7's MC DR is 11, so the squad is broken. In addition, 12 (11 + 1) is greater than 10 (Morale 7 + ELR 3), so the broken 1st Line 4-4-7 is replaced by a broken Conscript squad. The MMG will fire again, this time at yU3. The shot is 4/+1, and the DR is 6 (colored dr is 3), resulting in a PTC and no ROF (the 9-2 leader prevents cowering). Place a Prep Fire counter on yCC3. Place a DM counter on yW6. The German player is tempted to declare Double Time with the stack in yCC2 and move the entire stack to yX6 at a cost of 8 MF (4 MF + 2 MF Double Time + 2 MF moving with a leader). If they made it, they would then advance into yW6 and the safety of the stone building. There would then be little chance that the Russians could prevent them from capturing yU6 on turn 4 and winning the game. But the 2/–2 shot they would take from the Russians in yU3 (–1 FFNAM, –1 FFMO) has just enough chance of success to make the German player worry about what happens if things go wrong. He decides to play it safe, instead. The stack in yCC2 moves together with the leader, expending 6 MF: yDD2-yDD3-yDD4-yEE5-yEE6. The 4-4-7 in yU3 fires a long range shot at yCC3. The shot is 2/+1, and the DR is 6 and doubles, so cowering moves the shot to the 1 FP column where there is no effect. No activity. Remove the Prep Fire counter. The broken 4-2-6/LMG in yW6 routs to yV6 and is placed under the 7-0 leader to show that the DM counter affects the squad but not the leader. The stack in yEE6 advances to yDD6. No repair roll is made for the LMG, because the unit that possesses it is broken. The broken 8-1 leader in yZ9 attempts to self-rally. The rally DR is 5, which succeeds, so he is flipped over to his unbroken side. The 8-1 now attempts to rally the two broken squads in that hex. The rally DRM is –2 (–1 leadership, –1 building hex), so a DR of 9 or less will succeed. The first rally DR is 7, and the second rally DR is 4, so both 4-4-7 squads are rallied and flipped over to their unbroken sides. The 7-0 leader attempts to rally the broken 4-2-6 in yV6. The rally DRM is +3 (+4 DM, –1 building hex), so a DR of 3 or less will be needed. The rally DR is 7, which fails. Remove the DM counter. The Germans cannot attempt to self-rally the broken HS in yDD5, because it is not their player turn. The 4-4-7 in yU3 fires a long range shot at yCC3. The shot is 2/+1, and the DR is 6, which results in no effect. Place a Prep Fire counter on yU3. The stack in yZ9 fires a long range shot at yDD6. The players pause to make a LOS check, in order to count the hindrances from the orchard hexes correctly. Both stacks are temporarily moved out of the way, and a string is stretched from the center dot of yZ9 to the center dot of yDD6. The LOS check shows that the LOS passes through yAA9 and yBB8, but it does not pass through yAA8 (although it comes very close! ), so there will be a +2 Hindrance DRM on this shot. Note also that the woods hex +1 TEM will also apply, even though the LOS follows the road depiction in yDD6 and never touches the woods depiction. The only time that the road would cancel the +1 TEM is if the Germans were fired upon during their MPh while moving along the road, and even then only if the LOS did not touch the woods depiction. The shot is 4/+2 (–1 leadership, +2 orchard hindrance, +1 TEM), and the DR is 9, resulting in no effect. Place a Prep Fire counter on yZ9. The stack in yCC3 fires at yU3 (long range for the squads). The shot is 12/+1 (14 FP), and the DR is 2 (colored dr is 1), resulting in a K/3 and ROF for both MGs. The 4-4-7 squad is replaced by a 2-3-7 HS. The 2-3-7's MC DR is 6, which breaks the HS (6 + 3 is greater than its Morale of 7). Flip the 2-3-7 to its broken side, remove the Prep Fire counter from yU3, and place a DM counter on yU3. The MGs in yCC3 will fire again, this time at yZ9. The Russian player immediately demands a LOS check. The shot is 8/+2 (–2 leadership, +1 orchard, +3 TEM), and the DR is 11, resulting in no effect and no ROF. Place a Final Fire counter on yCC3. The stack in yDD6 fires at yZ9. The shot is 8/+4 (–1 leadership, +2 orchard, +3 TEM), and the DR is 7 (colored dr is 5), resulting in no effect and no ROF. Remove the Final Fire counter. The Russian player declines to rout the broken 2-3-7 HS, since the stone building it occupies is by far the safest place for it. The stack in yZ9 advances into yZ8. The Russian position continues to deteriorate. The only good news for the Russians was their northern force rallying, but they are way out of position and drawing a ton of German fire. The Germans are now ready to leave the cover of the tree line and begin the actual assault. The Germans attempt to self-rally the HS in yDD5. The rally DR is 7, which fails. The Russian 7-0 leader attempts to rally the 4-2-6 in yV6. The rally DR is 7, which fails. The German player announces that the stack in yDD6 will move as a stack with the 8-1 leader (6 MF)... and use Double Time (8 MF)... and use the road bonus (9 MF)! Place a CX counter on the German stack. The stack moves yCC7-yBB6-yAA7-yZ6-yY7 (5 MF expended so far) at which point the Russian player announces a Defensive First Fire shot against them by the stack in yZ8. The Russians must shoot: the German stack's 9 MF will take them all the way to yU7, and then nothing can stop them from advancing into yU6 to win the game. The shot is 8/–3 (–1 leadership, –1 FFNAM, –1 FFMO), and the DR is 11, resulting in a NMC. The 8-1's MC DR is 8, so he is pinned and cannot assist the squads in their MCs. The LMG/4-6-7's MC DR is 10, breaking them. Flip the squad over to its broken side. The 4-6-7's MC DR is 8, breaking them. Flip the squad over to its broken side. Place a DM counter on top of the two broken squads, and a Pin counter on top of the 8-1 leader. Place a 4 Residual FP counter on yY7. Place a First Fire counter on yZ8. The stack in yCC3 will move as a stack and declares Double Time for 8 MF. Place a CX counter on the stack. The CX counter lowers the 4-6-8's IPC to 2PP, which is one less than the MMG's 3PP, so the stack will only have 7 MF if they bring the MMG along. The 9-2 cannot assist the 4-6-8 in carrying the MMG, because his IPC is lowered by the CX counter as well, from 1PP to 0PP. The stack expends 7 MF to move to yV5. Place a DM counter on the adjacent broken 4-2-6 in yV6. The Russians in yZ8 cannot use Subsequent First Fire to fire on the German stack as it moves to yV5 because the Germans in yY7 are closer. The first German stack sacrificed themselves to draw the Russian fire, giving the second stack a clear path to the objective. Forcing the defender to fire at a nearby unit in order to let units further away move freely is a very common, and very powerful, tactic in ASL. The Russians concede at this point, as there is nothing to prevent the Germans from advancing into yU6 during the APh to win the game. This scenario ended up being a lot more dependent upon Prep Fire than I thought it would be, and I certainly didn't expect it to end with the entire German force madly charging across the map in Double Time! But that's part of the appeal of the game: when you sit down to play ASL/ASLSK, you can never know for sure what's going to happen! On turn three, the Russians could have skipped their Prep Fire to Assault Move into yZ8, and then advanced into yZ7 in their APh. This would put them into position to attempt to recover the MMG during the first RPh of turn four, and it would also have allowed them to use PBF against any Germans running along the road. But the German answer to this would have been to pound them with a clear Prep Fire shot from the kill stack in yCC3, which probably would have broken them and allowed the other German stack to run along the road and win the game anyway. On turn four, the Russians could have tried to stop both German stacks by splitting their defensive fire: one 4-4-7 firing at the 8-1 stack on the road (a 4/–2 shot) and the other 4-4-7 with 8-1 leader firing at the 9-2 stack (a long range 2/–3 shot), although judging the LOS to the 9-2 stack would have been tricky for the Russians (a LOS check can only be made after a shot is announced). But the Russians would have needed some luck to stop both German stacks with these shots, and I was more interested in clearly demonstrating the technique of sacrificing a unit to draw the enemy's defensive fire. I think that the Germans could win this scenario in three turns, although it would require near perfect play on their part, and no bad luck... so I think that four turns would be the proper time limit. It's possible that it might be a little too hard to win as the Russians with a four turn time limit. This could only be determined for certain by playing the scenario several more times. If the Russians do need a bit of help, you could try adding another 4-4-7, or dropping the German 8-1 leader back to an 8-0. Having now played this scenario once, I can see ways to improve both the German attack and the Russian defense, starting by changing their set-ups, so I can't claim that the scenario was particularly well-played. But I hope that it will have given you an understanding of how the various elements and rules of ASL all come together in the course of a game. You should now be able to play, and enjoy, any of the scenarios in ASLSK #1. Part 4 of this series will move to ASLSK #2, using the boards and counters of that module to look at Guns and mortars, which will lay the groundwork for Part 5 to dive into the complexities of the armor rules in ASLSK #3. The format for these next parts will be the same as in the first two: small tactical situations will be used to demonstrate specific rules and units, instead of presenting an entire game from start to finish as was done here in Part 3. If you still have questions concerning ASLSK #1, you can get quick answers in the Rules folder here on BGG, or on any of the other ASL discussion forums that can be found on the Internet. If you feel strongly that I've overlooked some part of ASLSK #1 that should be covered in this tutorial series, let me know. I can always come back later and do a "Part 3.5" if necessary! But it is simply not practical to cover every single rule, and every possible game situation, in a tutorial. The goal of this series is rather to get you comfortable enough with the rules that they start to make sense on their own. In addition, there is a wealth of other material on the BGG ASLSK pages that would be of interest to those who are learning to play ASLSK: player aids, session reports, strategy articles, rules discussions, etc. Just your friendly, neighborhood game player and superhero! Any chance of you making this series as a download? Perhaps with illustrations? Better yet, contact MMP and see if they'll let you rewrite the rulebook. Now that I have bought BV and the Rulebook, I think that I will have to invite you to Spain to receive face-to-face tutorials on the ASL. Once again, thank you for making this fascinating game playable for me. Again on the mark!! Fantastic!!! MMP could learn something with this: how to bring new blood to the game!!! I'm holding my breath for the tanks tutorial!!! Thanks again for a great article. I just purchased SK#3, and am waiting for your tutorials on Guns and Tanks. Your articles helped me immensely learning SK#1. Another BGG member has now uploaded a PDF version of the first three tutorial articles in the Files section here. This is a very plain PDF: no special formatting, no graphics, etc. but if you just want something that will print out nicely, or that can be accessed on a computer that is not connected to the Internet, you might find it to be sufficient. I simply don't have the time or the desire to put together a PDF version myself. A couple of other BGG members have indicated that they are also going to make PDF versions, so perhaps they will be able to include some VASL graphics or actual gameboard photos. At this point, rewriting a rulebook would probably be right at the very bottom of my "things I'd like to do someday" list! It ain't gonna happen. As I work on these tutorials, I am becoming ever more amazed at what Ken Dunn and the guys at MMP have accomplished here... sure, the rules have some problems, but they have packed so MUCH stuff into so few pages! I'm currently writing the next part that will deal with ASLSK #2 & Guns, and I keep wondering: "Where are all of these $%^## rules coming from!?" There's just no end to them; there's always something else that needs to be demonstrated and discussed. But, that depth of rules is part of what makes ASL so much fun to play... and so hard to learn. I think that rules and tutorials always have to be two separate things. Hopefully, after you've worked through these tutorials, you'll agree with me that the ASLSK rulebooks are actually pretty good (especially the one for ASLSK #3, which incorporates most of the errata for the first two). A really good, detailed Index to all three rulebooks is about the only thing that's missing. So am I, but probably for a completely different reason than you: sheer terror at the thought of having to write that beast! A FtF opponent? Someone that can introduce me into full ASL??? I am buying a bigger table and a spare bed, right now!! (Ok, I am not bad at Princes of Florence, so maybe I will be able to fit everything in my apartment). BTW, I've finished reading Chapter A of the full rulebook, and now I realised how wonderful the SK are, I understood everything without much trouble (sometimes reading something twice, but more for language issues) and felt that I knew almost everything from the SK!!!! 1. Play a scenario with full blown rules (looking for infantry-only scenarios and waiting for SL boards to arrive -BTW I won an e-bay auction for them yesterday for 9.99$ each and now I learn that MMP is selling them for 1$ D'oh!). 2. Buy SK 2 and 3. 4. Learn how ********* works Vasl so I can play it. Part 4 has now been posted over on the ASLSK #2 page. Jay, a huge thankyou for these amazing tutorials. I have learned so much from working through the first 3, and what is more, it has been great fun as well. Russian turn 2, prep fire phase, second shot: "the 4-4-7/MMG in yZ9" should read "the 4-4-7/MMG in yZ7". German turn 3, movement phase, 3rd para: "the stack in yCC3" should read "the stack in yCC2". German turn 3, movement phase, 2nd para: I'm confused about the movement path , it seems to skip yY7. Aaugh! Yes, you are correct. It should read "yY7" instead of "yX7"... and it needs to be changed in two other places as well. Note, however, your own error here: this is German turn 4, not turn 3. See how easy it is to mess up? Thanks for pointing out these errors, Peter. I've corrected the article. 1000000000000000000000000000000000000000 of thanks for these great articles. Hoping to read more from you. Specially armor. Could you also treat specially Parachutes and GLiders? Fabulous articles. I'm an ASL rookie who's taken the plunge and is reading the tome known as the full ASL rules nightly as I fall asleep. I have the binder ring indentations to prove it. "A broken unit not under DM that ... is attacked by enough FP ... to possibly inflict a NMC is placed under DM." In other words, whenever a broken unit not under DM is fired upon, it will often regain DM even if that attack has no other effect. All that's required is that there was some chance that the shot could have inflicted a NMC result. For a shot to have no chance at all of resulting in a NMC result (which would not put a broken unit back under DM), the shot would have to have a lot of positive Hindrance/TEM modifiers and/or the shot's FP would have to be very low. Inch by inch, I'll get it. This series is totally awesome. Thank you so very much. Just bought the 1st edition rules for ASL and have read about 50%. Was very lost but now it is much clearer. It looks like a great game and am looking forward to playing. Last time I played was in the mid 80's when Squad Leader was king. The shot is 4/+2 (long range for the squad, normal range for the LMG, +1 hindrance for yX6). Is there a hindrance for yX6? If you trace the LOS it's been traced along the hexside, but it doesn't go through the orchards. Is there already a hindrance if it's been traced along the hexside? Yes, the Orchard Hindrance applies even if the LOS only lies along the Orchard's hexside. "An Orchard hex is considered Inherent Terrain (3.2.1) so the entire hex including hexsides affect LOS drawn through an Orchard hex." Thx for the explanation, Jay. You're the "patron saint" for SASL-newbies like me. Would be interesting if you could make some tutorials for the real ASL as well! Very glad to add the 100th thumb up to this great series of Aslsk walkthrough. Wonderfull job! If (hypothetically) an LMG keeps rolling a colored 1, it could (hypothetically) keep firing all day? Ditto for a MMG rolling colored 2s? In the Prep Fire Phase and the Defensive Fire Phase, yes. If you keep making your ROF you can literally fire until you run out of targets to fire at! In Defensive First Fire (during the enemy's Movement Phase), you have the added restriction that you can only fire at moving targets. A silly question: why are the higher-numbered hexes referred to as "North"? A few times you'd mention the Russians in the north and confuse me since I thought it meant those in U3, until I worked out that it only made sense to be Z7-Z9. Thanks for the tutorials, learning from the rulebook alone isn't the same thing at all. * Orient the maps normally, so that North is up, but then all of the hex IDs would be upside down and hard to read. * Rotate the maps 180 degrees so that the hex IDs could be read easily, but then North is down, and the Germans appear to be attacking in the wrong direction. I chose the second option, believing that the odd directions would be a small price to pay for having easy-to-read hex IDs. Maybe I was wrong... but both options involve a certain level of awkwardness that is unfortunate in a beginners' tutorial. This wasn't an issue when I wrote the tutorial, because I originally did not include any illustrations at all. I didn't rewrite any of the text when I added the illustrations, but there was already a description of which way is North: "The road in yY10 exits the North edge of the map." Readable hex IDs was the way to go, I just didn't think about it in a historical context and missed the line about the road giving the orientation. The illustrations definitely helped, there were a couple of times where I had my pieces in the wrong place (following along on my desk) and could scroll back to see where I went astray.